For the second time in Phillies history, one of our guys sent 27 players from the opposing team back to the bench without a hit, without a walk, without ever reaching first base! That, my friends, is a perfect game! (Top Photo) 1964 team photo. 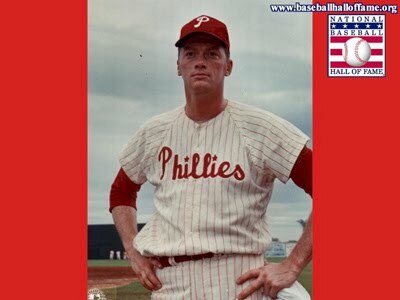 (Bottom Photo) Phillies' ace, Jim Bunning. Roy Halladay, the big name off-season acquisition, not only cashed in big time here, in 2010, but he also earned a little immortality among the Phillies "Phaithful," and around the majors, as well. I could bore you with all the comparisons between Halladay's perfect game against the Marlins, in Florida, and Jim Bunning's Father's Day masterpiece against the Mets, in New York, 46 years ago, but that stuff is all over the Internet by now. 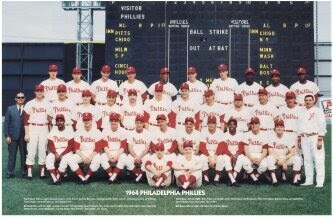 For all those Phillies fans, who were not around in 1964, and are now scratching their heads, saying "Jim Whooo???" what I would like to offer is a snapshot of life as a fan for those of us who did experience that portion of team history. Little did I know, at the tender age of 10, that Bunning's perfect game would probably be the highlight of our season. Oh, there would be a lot of games yet to be played, and a lot of games yet to be won, but what we didn't count on would be losing 10 games in a row! Yes. What loomed ahead was the fact that the Phillies would squander a 61⁄2 game lead during the final weeks of the season. The team would lose 10 games in a row with 12 games to go. They would lose the pennant by one game to the St. Louis Cardinals. Today, as we bask in the glory of two straight NL Pennants, we cheer on a talented line-up that includes: Jimmy Rollins, Chase Utley, Ryan Howard, Shane Victorino, Jayson Werth, Raul Ibanez, Halladay, Cole Hamels, Jaime Moyer, etc. In 1964, in addition to Bunning, we had what many considered to be a pretty talented line-up, also. The '64 Phils included such names as: Johnny Callison, Wes Covington, Bobby Wine, Tony Taylor, Tony Gonzalez, Richie Allen, Art Mahaffey and Chris Short. So, as many of us were saving our Wheaties' cereal box tops in order to send away for a team poster 46 years ago, we would soon find out that by September, the Fightin' Phils would break our hearts. As Phillies fans, we have had a few no-hitters over the years, but a perfect game usually only comes by once in a lifetime. Savor it while you can! With just a few weeks remaining until the All-Star break, we can only hope the Phils survive these many trips to the DL, and stay on top in the NL East. A third NL Pennant and another World Series victory would be sweet, but for those of us who watched and witnessed 1964, we know that it is best not to hold our our breath. The pain of that 1964 season never goes away. Just ask the NY Mets fans of a couple of years ago. I still can't believe the Phillies were even able to get Halladay. Getting him was the perfect move to compliment the lineup. This lineup wouldn't do us any good without an ace like him, just look at the Brewers they can hit all day long and it doesn't even matter.